A scene from Bakoinai depicting D.A. 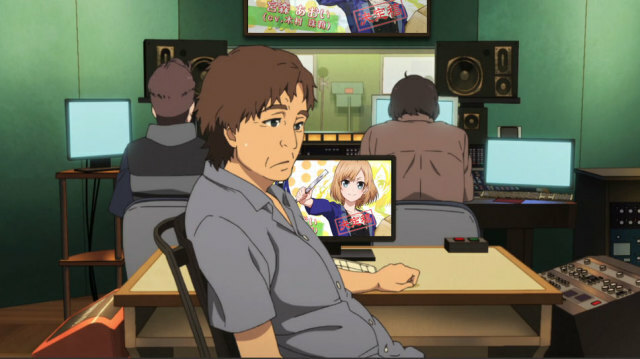 Works employee Mizushima Kanoue struggling during a dubbing session for Shirobako. The most recent issue of Kadokawa’s Monthly Dengeki Daioh announced that production on the new anime series Bakoinai has been greenlit. Bakoinai depicts the staff at studio ‘D.A Works’ as they work to create the anime Shirobako, which follows five girls as they work to succeed in the anime industry. According to a preview shown to selected media outlets, Bakoinai focuses on Takayama Midori, a production assistant at D.A. Works, the anime studio working on Shirobako. Subplots include Midori dealing with a lazy and inept co-worker, the D.A. Works staff struggling at adapt to a last-minute decision to change character designs, and director Mizushima Tsukomu’s unwillingness to draw storyboards. Voice acting roles that have been confirmed so far include Kimura Juri as ‘Mimura Juri’ and Chisuga Haruka as ‘Chisaga Maruka’. I now know what Xzibit will definitely watch next season. Wait, is this for real? Or this is just a joke? now we can have our hearts broken by people making an anime about having their hearts broken?